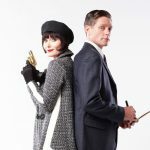 The worldwide fan base of Miss Fisher’s Murder Mysteries is so keen to see a theatrical movie spin-off of the series that admirers are donating serious sums of money. The Kickstarter crowd-funding campaign, which launched last Friday, has raised more than $443,000 for Miss Fisher & the Crypt of Tears, an action adventure/murder mystery. Of that, 46 per cent has been pledged from the US, where the TV series screen on Netflix, PBS stations and Acorn TV. Aussie fans have pledged 25 per cent with the balance from the rest of the world, including places as far flung as Russia and Brazil. The producers, Every Cloud Productions’ Fiona Eagger and Deb Cox, are immensely encouraged by the global support for the film, which will follow the adventures of Essie Davis’ Miss Phryne Fisher as an action hero with a strong feminine touch. “That shows there is an international market and a real thirst for the film which people will be prepared to pay to see,” Eagger tells IF. The plan is to shoot the feature scripted by Cox in Australia, London and either Morocco or Israel next May/June, directed by Tony Tilse, who was the set-up director of the series. The budget will be $8 million. The producers are applying for Screen Australia funding, will use the Producer Offset for the qualifying Australian spend, and are in negotiations with a domestic distributor and international sales agent. The Kickstarter campaign, which has 26 days to run, also has piqued the interest of private US investors. It took under two days to reach the original target of $250,000, which broke the Australian record for the most supported crowdfunding campaign for an Australian film. Gayby Baby rang up $104,756 in pledges. The aim is to reach $600,000, which will be spent on international locations, visual effects, production design and costumes. There have been more than 4,200 backers and the average pledge is $103. Eagger describes Miss Fisher’s character in the movie as a cross between Indiana Jones and Wonder Woman, without the latter’s superhuman powers. Set in the late 1920s, the plot will follow the detective as she embarks on a global adventure to find missing treasure, solve numerous murders and break all aviation records. There will be romantic wayside stops in the Far East, glamorous sojourns in the mansions of London and a battle to survive the sands of the Arabian desert. The producers intend to cast series regulars including Nathan Page as Detective Jack Robinson, Ashleigh Cummings as Dot Williams and Miriam Margolyes as Aunt Prudence. The series ran for three seasons on the ABC and has been sold to 179 countries. The ABC was keen for another series but Davis was not available as she had moved to London with her husband, director Justin Kurzel, and their twin girls.